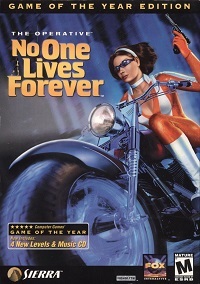 This No One Lives Forever Demo, known as the "Mega Mix Demo", consists of a tutorial and 3 short SP missions. The first mission is to save Monroe from assassins in Morocco by shooting them with a sniper rifle. The second is to escape a sinking tanker. The third mission takes place in Austria where Cate Archer uses a snow scooter in the mountains to get to the elevator to the baroness's castle.